Starship Amazing described their latest release as containing 'aggressively happy pos-vibes funk-jams for expressing inward and outward love' on their Tumblr page, and I simply can't think of a better way to put it. Ruby Dagger is a vivacious album that typifies what modern synthpop is all about; convivial basslines with an infinitely flexible structure, and considering that it reached number 1 on Bandcamp on its day of release (16th July 2013), it has proven to be a popular summer soundtrack. 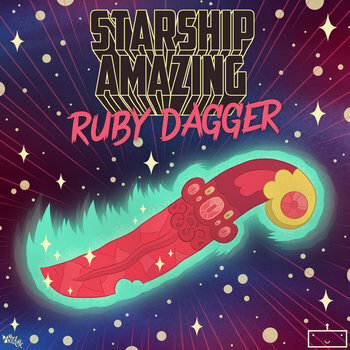 Despite the fact that I thoroughly enjoyed previous releases such as A Man Who Made A Choice and The Robot Trilogy, I'm glad that Starship Amazing have gone down a different path with Ruby Dagger as it shows that there is a lot more to come from this talented Alaskan electronic duo. In a nutshell, if you're down in the dumps then go and listen to this, it's one of the most cheerful albums I've heard all year. It took me back to the POP days... ah.